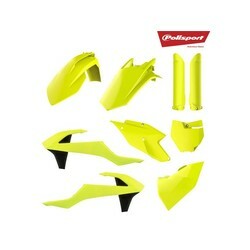 Why Polisport replica body plastic parts are the best choice for your Dirt Bike? Packaged in a new and rebranded kit box and individual bagged. * Polisport's standard MX Replica Plastic kit includes a Front Fender, a Rear Fender, Number Plate, Fork Guards, Side Panels and Radiator Scoops/Shrouds. (This may vary from model to model. Please see the images of the individual kit contents or check our catalog for exact list of the included parts).